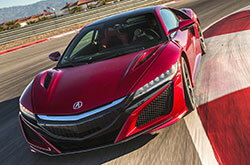 After a nearly 12-year hiatus, the Acura NSX supercar is back. Offering drivers a wonderfully innovative hybrid powertrain, as well as plenty of top-notch amenities and features, the 2017 Acura NSX in Arlington is truly an excellent choice for those shopping for new sports cars near Dallas. Take a look at our full 2017 NSX review below to see what this all-new version of the supercar has to offer! The 2017 NSX comes in one well-equipped trim level that boasts a wide range of features, including leather upholstery, LED headlights, dual-zone automatic climate control, a 7-inch touchscreen and adaptive suspension dampers. 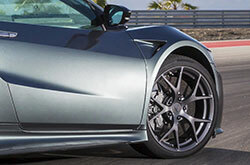 Drivers will also find 19-inch front wheels and 20-inch back wheels, which gives the roadster added power and aerodynamic efficiency. Acura's Technology package also comes on the 2017 Acura NSX near Dallas, which adds such features as navigation, AcuraLink and satellite radio. There are also several standalone features drivers can add to the car, such as carbon-ceramic brakes, more premium paint colors and summer performance tires. 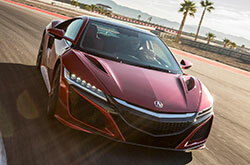 Many 2017 Acura NSX reviews have praised the supercar's groundbreaking hybrid powertrain that consists of three electric motors paired with a turbocharged 3.5-liter V6 engine. This powerplant produces a hefty 573 horses and 476 lb.-ft. of torque; the kind of power that supercar drivers will be looking for in their next new roadster. On top of this, there is a very efficient nine-speed automated manual transmission that helps the NSX achieve fantastic fuel numbers. The safety amenities available on the supercar have also impressed several 2017 Acura NSX reviews. Not only does the car come with such standard features as a rearview camera, side-protecting airbags, and front and rear parking sensors, but it also comes with the previously mentioned AcuraLink that provides everything from stolen vehicle location and automatic collision notification to emergency assistance. Stop by Vandergriff Acura today to learn more about the new NSX and to take it for a spin around Arlington! 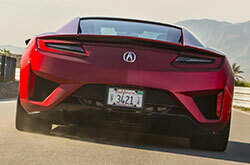 Want to View More Info About the Acura NSX? Don't just take into account the 2017 Nissan GT-R, Aston Martin Vantage and the Audi R8 when searching for new car models near Dallas; also be sure to take a good hard look at the handsome 2017 Acura NSX. You may realize that its attention-grabbing design and features are just what you in a daily driver. Take advantage of findings from our evaluation too determine if the 2017 Acura NSX is perfect for your commuting needs. Also make sure you take a peep at Acura OEM financing offers on our site! We're a neighborhood Acura NSX dealer with a truly incredible collection of vehicles and manufacturer incentives for prudent shoppers. We hope our 2017 Acura NSX review offers a helping hand when you're all set to make your final buying decision. Check out the Acura NSX in Arlington, TX; sending a request for a test drive at Vandergriff Acura is a simple process with our email form. Can't wait to see its trendy cabin equipment at our store? View our video now!